Ok, there are a lot of things I love about 4e, including the tactical fun of busting out the battlemat or dungeon tiles and mixing it up with minis and dice. 4e has made that a lot easier and faster, and I appreciate that. However, there are times when the prospect of digging out all the parts and pieces seems daunting. Maybe I don't want the mess, maybe the table's too small, whatever the cause, I want to run a fight without miniatures and battlemaps. At first glance this seems like a daunting prospect. So many of the special abilities and synergies of the characters in 4e hinge upon character placement and precision of movement that it is hard to imagine divorcing it from the grid. Thankfully, a few simple abstractions can make things go surprisingly smoothly, and once you have them under your belt, you should be able to handle fights on the fly with great ease. Now, as a heads up. This is going to seem a little fiddly at first, with it's new action types and abstract battlemat. Please bear with it for the time being - these tools are just training wheels to get across the underling ideas of the skirmish system. If players like the abstract mat, they're welcome to use it, but it's a simple enough tool that it can be easily set aside. The skirmish map is divided into 4 areas - Engagement, At Large, At Remove and At Great Remove. These are not literal locations, but instead represent where a character is relative to the scene at large. Characters in an Engagement are positioned relative to other characters or enemies. Because there might be multiple engagements in a scene, there are actually multiple spaces labeled Engagement. Characters who are "At Large" have not engaged with anyone else in the scene, but they also have not attempted to withdraw themselves from the conflict. Characters who are "At Remove" have backed away from the conflict, usually to attempt to stay out of melee and use weapons from range. Characters who are "At Great Remove" have positioned themselves as far from the fight as possible, either because they have a weapon with great range or because they're planning to make a run for it. At the beginning of a scene, the disposition of the characters and monsters on the map should be reasonably easy to extrapolate from the description. Are there any groups sticking together, including the characters? Make them an engagement. Is someone hanging back? Put them at remove. Are skirmishers spread out behind cover? put them at large. If in doubt, go ahead and just put folks at large, and let them sort themselves out. Rather than worry about exact movement values, the character's move translated into a mobility value, which is equal to half the character's level plus the number of squares they can move. For example, a level 4 human has a mobility value of 8 (2 + 6). Mobility Defense is basically 10 plus Mobility value. These values are used when a character attempts to outmaneuver another, but might also be used for defending a character against large scale efforts which are less about quickness and more about general ability to not be in the wrong place. Effects which add to a character's move add to mobility and mobility defense. Weapons with reach increase Mobility and mobility defense by 1. Because movement is not measured in squares, the default move action can move a character from one zone to an Adjacent zone. What zones are adjacent? At Large is adjacent to At Remove. Engagement squares are not technically adjacent to anything else. The only way to enter or leave an engagement is to Engage or disengage (see below). When in an engagement, the only way to depart is to Fast Disengage, which moves a character to At Large, but also exposes them to opportunity attacks from all enemies in the engagement. If the character has or is subject to an ability which grants them any number of shifts, they may reduce the number of opponents who get an opportunity attack by the number of shifts. For Example: Cyrus needs to get out of the knot of three goblins he's found himself in. He has an attack which lets him shift two spaces before or after his attack, so he makes his attack, and then uses his move action for a fast disengage. Normally all three goblins would get an opportunity attack on him, but because he has two shifts, he avoids two of them so only the third gets the OA. If a character is ever the last one in an Engagement space, he automatically moves to "At Large" as a free immediate interrupt. When engaging a character who is already in an engagement, you simply move into that engagement. When engaging a character who is at large, both you and your target move into an unoccupied engagement space. Engaging a character who is at Remove or Great Remove requires a Close action (see Below). A close action is an attempt to bring the fight to the characters who have distanced themselves, represented by forcing them out of their spaces. A close action is a Maneuverability attack against the defenders Maneuverability defense. If successsful, it moves a character from Great Remove to Remove, or from Remove to At Large. Performing a close action against a character at Remove is a move action, while performing it against a character at great remove is a Standard action, and they target receives a +2 bonus to their Mobility defense. Characters may only launch melee attacks against characters in the same engagement as themselves. Simple as that. Range is handles very broadly here, with three categories of weapons, short, medium and long. Only long weapons can be used usefully to and from At great Remove. If a weapon is attacking at its range or less, it is at no penalty. If it's being used at its maximum range, it takes a -2 to hit. Note that firing into an engagement is at a -2. Firing out of an engagement triggers opportunity attacks. Hit: 1/2 stat modifier damage for the weapon, and grant someone else in the engagement combat advantage against someone in the target. Cancel one opportunity attack before it is rolled. I'm torn on these. The easy answer is, frankly, a burst or blast (at least those of 5 or less) just attacks everything in an engagement. There are a lot of more fiddly options, but I'm not yet sure what to do with them. Walls can contain any engagement of a size equal to the # of squares in the wall. A Push, Pull or Slide is generally an attack against maneuverability defense, with a bonus equal to the number of squares to be moves. A succesfull push can push someone out of an engagement, a successful pull can pull them into one (or out of one, from another location), a slide can do either. Generally just use the core attack against the MD as well. It is entirely possible to use the map literally, with minis and everything, and describe all actions in terms of that. When an enemy starts to flee, you can describe his actions in terms of moving to remove and great remove, and move his token appropriately. Many players will appreciate that clarity. However, that is not the only way to handle the issue - the DM may simply describe the fleeing opponent without refernceing the map at all, and instead simply use the map as a guideline for how to apply the rules. The GM knows the enemy is about this far off and translates that to, say, At Great Remove, and knows how to apply rules to the players description of their actions. Neither approach is the correct one, but it is my hope that by they time they finish a reader would be capable of running it either way. Adjacency - Everyone in an engagement is considered adjacent to everyone else. 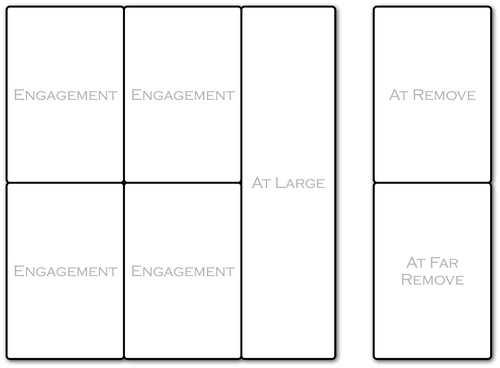 Range - Everyone in an engagement is considered within 5 squares of one another. a 10 square radius reaches the local engagement and at will (and other engagements if it makes sense). 20 square radius is everyone but Great Remove. John Harper made a good point that the number of opportunity attacks could be overwhelming. I'm pondering possibilities, including putting some cap on it (like 3) to making the number equal to the difference in sizes of the two sides. It maybe fiddly, but the size difference one (plus taunts, of course) might be the most reflective on. And it al becomes moot when you drop the abstraction. In a descriptive fight it's generally going to be a little more clear who you're eluding. Even further fiddliness - what if there was a combat advantage wequivalent that was "position advantage". Anyone who has it on you has moved to block you, so they get the OA. It's one more thing to track, but it does allow surrounding folks.